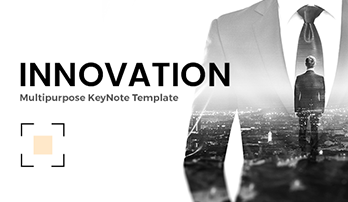 “ONE” Keynote template - Download Now! 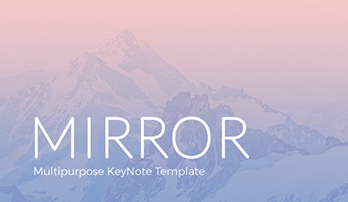 What is the “ONE” Keynote template for? During many public presentations, it happens that the whole audience is engaged in their own affairs and does not pay attention to the speaker and hisher presentation. It is a standard practice. Speakers can blame the “smartphone era” as the side effects, but even our attachment to gadgets and the general absentminded attention it generates do not change the fact that many presentations that are being prepared by the speakers are simply uninterested and boring. The problem is that often even the most beautiful images, correctly chosen words, and good visual effects are not enough to attract attention of the audience. According to many studies, from 80 to 90% of the information processed by our brain, are represented in a visual form. We are created to think and remember information from images. It seems easy: just pick up correct images and that’s it! But the key point is not how accurately you picked up the images for the presentation, but what stories you tell demonstrating these slides with images. Thus, a good presentation is a mix of a quality presentation and a charismatic speaker. To prepare a quality informative presentation is not an easy task as you may have thought. Nevertheless, we can provide you a solution that will help you. 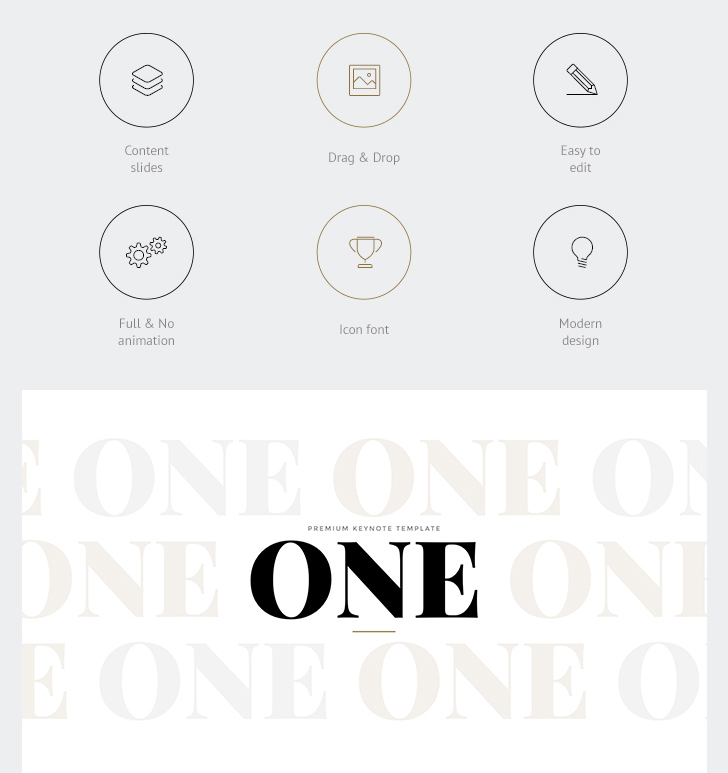 Our ready-made multipurpose “ONE” Keynote template is a perfect tool for work and creating presentation that will become your assistant. 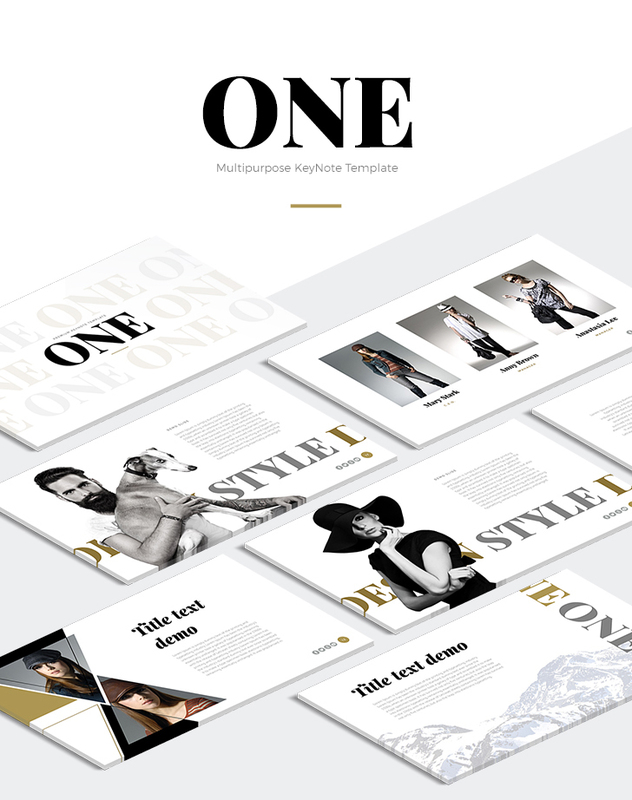 46 multipurpose slides equipped with useful tolls and necessary elements make the template. A wide range of information and data can be easily demonstrated with this template due to its great number of multipurpose slides. A team of professionals works on structuring and organizing the slides so that it will be possible to present the topic coherently and logically. The use of premade templates and content slides let you avoid typical mistakes made by non-professional employees who do not use the templates. Their work is harder and takes more time while our premade template has a number of peculiarities. High quality. This characteristic assures you that in case of using high-resolution devices (such as projectors and so on), the quality of the project won’t get worse. No visible defects, no blurred segments. It is a printable template. The handouts can be printed without worries. Modern design. The experts suggest avoiding luminous and very bright colors in the overall design. You should think about the combination of background and graphs, charts and tables in your presentation. 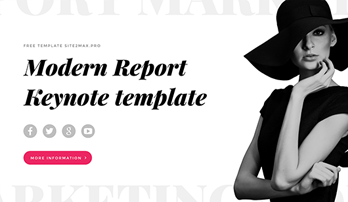 Therefore, this template has a modern minimalistic design that can be used for any type of presentations. A correctly chosen design will catch the listeners, impress them. Built-in tools. All infographics and other elements are absolutely editable. A multipurpose template. The slides are fully multipurpose. Their design and composition allow to use them for a number of marketing and business works. If you want to create a good reputation and impress the listeners, this template is what you need. Easy-to-use ready-made slides. The template is easy to use. Absolutely any user regardless the level of computer skills and literacy will be able to use the slides and work with them. You’ll have the opportunity to make projects in a few minutes due to its ready-made character. This template will simplify your working process and significantly save time. Free 247 support. We will be glad to help you in case of having any difficulties or questions.